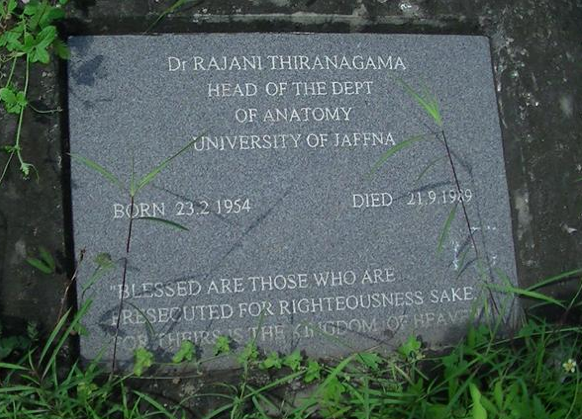 It was 25 years ago on September 21st 1989 that Dr. Rajini Thiranagama nee Rajasingham was killed in Jaffna. She was 35 years old at the time of her death.The 25th anniversary of her death is to be commemorated through a series of events next week in the northern capital. This is the first time that such a commemoration of Rajini’s memorable legacy is to be held in Jaffna, since the one held in 1989, a month after her death. A Commemoration Meeting is to be held at the Medical Faculty, University of Jaffna on September 20th at 9.30 a.m. On the same day at 2 p.m a procession for peace, democracy and social justice will start at the Medical Faculty, University of Jaffna and end at the Veerasingham Hall with a short meeting.On September 21st a seminar will be held at 9 am on the theme “A more just and democratic society”.The venue is the Kailasapathy Hall, University of Jaffna. Rajini was a contemporary of mine at Jaffna Collge,Vaddukkoddai where I completed my GCE- Advanced Level. Her father Mr.A. Rajasingham was the vice –principal during my time. Rajini born on February 23rd 1954 studied at Jaffna College(JC) from grade one till entering varsity except for a short period at Chundikkuli Girls College in Jaffna town. All of her sisters Nirmala,Sumathy and Vasuki were at JC too. In school she was known as Rajini but later on her name was spelled as Rajani .Yet we the old students of JC continue to refer to her as Rajini and I too am doing so while writing this article. It is hard to believe that twenty-five years have passed since Rajini was brutally gunned down at Thirunelvely, Jaffna on September 21st 1989 while cycling back home from the Jaffna University. She was Professor of Anatomy at the Jaffna Varsity medical faculty. The 35 year old mother of two daughters –Narmada and Sharika- was also a human rights activist, feminist, critic of narrow nationalism and opponent of irresponsible militarism. When Rajini was killed there was some confusion initially about who her killers were. Some university students staged a protest demonstration blaming Tamil armed groups functioning as lackeys of the Indian army. This was so because Rajini had very often clashed with the Indian officials on issues of human rights violations. Subsequently it became clear that the Liberation Tigers of Tamil Eelam (LTTE) was responsible but Rajini herself had a premonition of her death and in a letter to someone she was close to, had said that her killers would be sons nurtured in the womb of Jaffna. Two and a half decades of years have failed to erase the indelible memories of Rajini among those who knew her. Her brutal murder has never been forgotten. Whenever the human rights violations of the Liberation Tigers of Tamil Eelam are referred to in detail her name always crops up. Whenever the tragic plight of women caught up in Sri Lankas long drawn out “Machismo” war is highlighted her murder is usually focussed upon. Whenever the story of how the Tamil liberation struggle went terribly wrong is discussed the murder of Rajani Thiranagama is always an issue cited. No one has officially claimed responsibility for her killing so far and several attempts have been made by those close to the perpetrators to deflect blame elsewhere. Despite these moves the people at large knew who the killers were though not many dared to say it publicly at the time. It is now clear that two of Rajini’s students at the Jaffna medical faculty played a dirty role in the killing. They did not pull the trigger personally but as members of the LTTE’s “intelligence” wing had supplied the info on the basis of which she was killed by a tiger hit squad. One of them functioned later as a doctor in the LTTE medical unit. Both are now abroad in a European country now. The identity of the actual assassins is unknown. Many years after Rajini’s death former Eelam Peoples Democratic Party (EPDP) Parliamentarian and “Thinamurasu” weekly Editor Nadarajah Atputharajah alias Ramesh attempted a whitewash of the LTTE by claiming that the “Mandaiyan Kuzhu” (Mandaiyan group) of the pro-Indian Eelam Peoples Revolutionary Liberation Front (EPRLF) had killed Rajini. Ramesh at that time had begum associating clandestinely with the LTTE. Though the EPRLF “mandaiyan group” had killed several people regarded as being pro-LTTE that outfit had not killed Rajini. But Ramesh wilfully distorted the truth. He was in turn killed at Wellawatte along with his brother in law in what was suspected to be an internal killing. Though I was a batchmate of Rajini at at Jaffna College we were not classmates. She was in the science stream and I in arts. Although I was friendly and maintained cordial relations with Rajini I was not a close friend of hers.Rajini’s sister Nirmala was in a class higher than us. At JC I was much closer to Nirmala than Rajini. I did not interact with Rajini on a regular basis after Jaffna College days and met her only on a few occasions , more by accident than design. The last time I saw her was in mid-1988 at the International Centre for Ethnic Studies (ICES) in Colombo. We had a lengthy conversation on the contemporary political situation and Rajini was critical of some of the articles I had been writing in “The Island” at that time because she felt I was being supportive of the LTTE. The first major military operation undertaken against the LTTE by the Indian Army was codenamed “Operation Pawan”. Pawan meant strong or gusty wind. In an earlier article I had used the sturdy Palmyrah tree as a metaphor for Jaffna and queried “Can the Pawan break the Palmyrah”?Mansoor the sub-editor at the “Sunday Island” then had put that query as the heading for my article. I had in the article mentioned that the Palmyrah tree would sway dangerously against strong wind and at times would break or be even uprooted but would never bend. What I tried to indicate then was that the LTTE would prefer to be militarily defeated and break but would never agree to a surrender and bend.We were seated in the ICES “Thatched Patio” and I remember Rajini repeating the line “The Palmyrah is broken, the Palmyrah is broken” in response to that heading and sentiment. She had with her parts of a manuscript that was ultimately published as a book called “The Broken Palmyrah”. Rajini very kindly allowed me to take photo copies of some sections that I found interesting. These were about the plight of women during the fighting with the Indian army. I later published excerpts of these in a magazine which I edited briefly in Toronto. Another thing I remember about our last meeting was her disapproval of my minor role in an attempt at that time to bring about rapprochement between New Delhi and the LTTE. My involvement was only because I felt that such a move was in the best interests of the Tamil people. It was a quiet effort but the Indian newsmagazine “India Today” had revealed some details and mentioned my name.Rajini was of the view that the LTTE was only playing for time and that I was being deceived. I was not in Sri Lanka when Rajini was killed. I had left in September 1988. She was dead in September 1989.A quarter of a century has passed by and much water has flown down the Nandhikkadal lagoon since then. The LTTE has been vanquished militarily but the aftermath is yet to bring a bright dawn of hope to the Tamil people. Any reference to Rajini would be incomplete without specific mention of her husband Dayapala Thiranagama. Their union was one which cut across race,religion,caste and class.Dayapala himself had been involved in political resistance against oppression.He was a fighter for the downtrodden underdog and had faced periods of imprisonment at the hands of the state. “I met Rajani in September 1976 when the student unrest was rapidly spreading within Sri Lankan universities and there was a renewed militant student activity among the university students. An innocent student, Weerasuriya at Peradeniya had been gunned down by the police and the student militancy grew stronger in the face of such atrocities against the student movement. These were extraordinary times. The political unrest in the country had already begun to change our lives and our lives in turn were set to change the political course of the country, even in a small way, to a point of no return”. “I had just come out of prison for the second time after spending long years in prison in 1976. 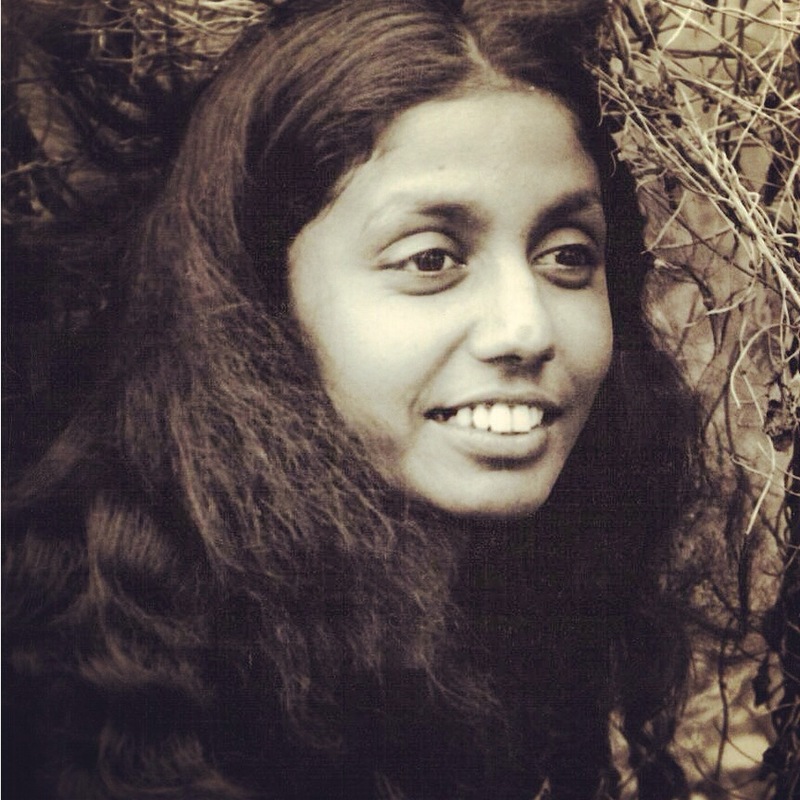 Rajani, a young Tamil woman with Christian religious background and radical political thinking had just started to influence the medics at the Colombo Medical Faculty with her thirst for justice and democracy against a repressive state apparatus that had a hallmark of historical discrimination and violence against Tamils. I had just become a university academic by this time. When we met and forged our relationship it was clear that our lives would never be the same again, for us, as well as our children who were yet to be born”. “We got married on 28 August 1977 in Colombo, without a ceremony, in the midst of anti- Tamil riots in Colombo. On the day we got married we stayed in Rathmalana with a Sinhalese friend of mine and her father loaded his shot gun and kept awake all night in order to protect us as a number of Tamil families had been attacked on the previous night in the neighbourhood”. “Our marriage brought together two ethnically, socially, politically and culturally diverse individuals into a relationship based on human understanding and deep love which appeared unshakable at the time. Once she wrote to me saying that her love for me was as deep as the ocean. With all these differences, one of the most interesting issues was how far our loving relationship with all its complexities would serve to protect our marriage during a politically divisive time when the two communities were at war and in which the Tamil minority was at the receiving end. Both Sinhalese and Tamil popular cultures had been at war with each other and the Sinhalese considered their culture was superior”. “Rajani had no issue whatsoever about my social class vis-à-vis her middleclass background. She defended me strongly within her own middle class family members and outside whenever it came to their attention that I had not been living up to their middle class norms”. “We were also politically different and in reality these political differences played a divisive role in our marriage. I had near religious belief in the Marxist-Leninist/Maoist political agenda and Rajani wanted to apply the revolutionary success stories in other countries to Sri Lanka as pragmatic examples of social justice. It was also due to this pragmatism that Rajani became closer to the Tamil Tigers in her own political journey. In the same way this core ideological belief of pragmatism benefited her to turn her energy and emotions into human rights campaigning later in her political life when she left the Tamil Tigers”. “When I met Rajani I had only just left prison I still had scars of torture all over my body and while in prison I had never expected to live again let alone have a relationship. Rajani showed extraordinary courage to accept me as I was with all the differences between us, with my own social and political past which was such a contradiction to her own middle class life and aspirations. She had to battle it over with her family. Rajani had accepted that I would one day leave her and go in order to fulfil my political responsibilities. It was also accepted we would not meet again once I left the family”. “My generation had undergone a tremendous change in their mind set and all our personal needs and aspirations had to be suppressed for political justice and the emancipation of the poor. We also had a very deep sense of family ties and gratitude and the need to provide for our parents who underwent untold sufferings to bring us up. This sentiment and obligations we had suppressed in the belief that social justice followed by the armed revolution would resolve this for ever”. “The woman herself was deeply shocked and was in a state of distress. It would have been the most difficult message she had to ever deliver to a totally unknown person within such a short time in such a few words. I still remember the incredible speed with which my head started spinning and how speechless I was”. “The woman who brought the message of Rajani’s death for me in Colombo later became an invaluable friend who was right beside our family’s side in London whenever we needed support”. “Rajani was buried in her family cemetery in Nallur on 25 September 1989. I walked with my two young daughters hand in hand, the most difficult, most painful and saddest of walks in my life. Along with her, the happy days of our family were buried and the family was never the same again without her presence. We have not been able to visit her grave for twenty long years. Each day her daughters passed without their mother, brought home to them their irreplaceable loss”. “They joined other children in Sri Lanka who lost their parents due to the war. The irony was that it was me, not Rajani who had expected to die in the struggle and she had accepted that her role would be to care for the children. But the total opposite happened. At the beginning of our relationship I never thought that I would end my political career for the responsibility of looking after my children. I thought that my involvement in Sri Lankan politics would result in my death. That did not happen”. “Instead Rajani gave her life for the human rights of the Tamil people and I had to be alive for the children. I looked after them until they were independent. But my tribute goes to Rajani. It was Rajani’s solid foundation she laid in their formative years that helped me to complete the task. This situation was not specific to my children or family. Such was the dramatic transformation of the political situation and its impact on individual members in the Tamil community within a short period of time of militant activity”. Rajini Rajasingham Thiranagama was truly a heroine of our times and an unforgettable symbol of the Tamil tragedy that enveloped Sri Lanka. As Dr. Radhika Coomaraswamy once observed she(Rajini) “ had a vision for her people, the Sri Lankan Tamils. She envisioned a time when they would live in peace and dignity enjoying democratic rights and freedoms. Standing against oppression and brutality in all its forms, she is a beacon of light for a community living in fear and struggling for self – respect. She will never be forgotten; an icon for everyone in Sri Lanka fighting for freedom “. « News Reports Stating Indian National Marceli Thomas Had Confirmed Existence of Plot to Assassinate President Sirisena, Mr.Rajapaksa and Others are ” False,Baseless and Inflammatory” Says Mangala Samaraweera.